How was the weekend? Mine was fantastic. The boys were gone with their dad and I had every intention of working all weekend and taking the husky for a forever long hike buuuuut that didn’t work out. I did, however, have this Peach Blueberry Crisp to pick at while I caught up on everything last night so it wasn’t too bad. So, here’s the thing about Texas and I’m assuming it’s the humidity that causes this? But produce doesn’t stay as fresh for as long as it did when we lived in Colorado. Like, I’ve got maybe 2 days before strawberries start to get gross. And if you know me at all, you know that I am the queen of having good intentions when it comes to buying groceries and then eating instant black bean noodles for every meal. ANYWAY. 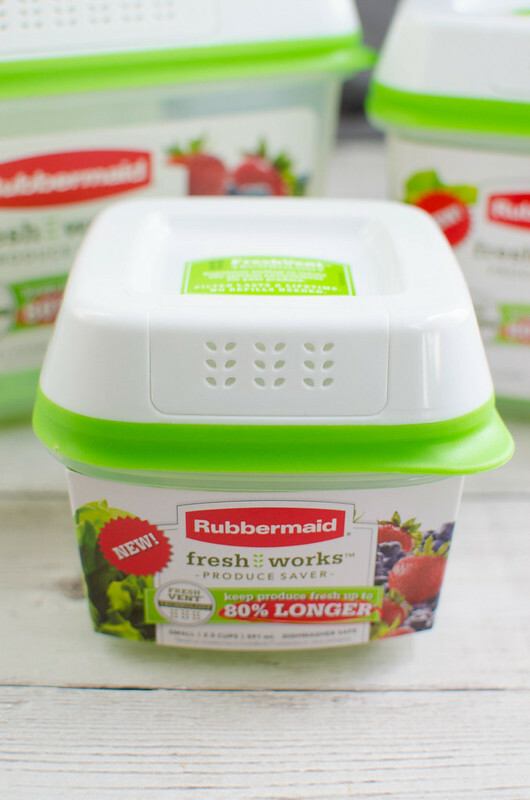 So I’ve been using these Rubbermaid FreshWorks food storage containers for all my berries, all my greens, and random cut-up salad stuff like cucumber and carrots. The containers use patented FreshVent technology to keep produce fresher up to 80%* longer than if you just left your produce in the containers they come in. It regulates the flow of oxygen and carbon dioxide to create the optimal environment for your produce and the CrispTray helps reduce moisture and spoilage. The containers are also microwave and top-shelf dishwasher safe. Plus they’re BPA free and the lid filter lasts a lifetime so you never have to replace it! I’m obsessed. I haven’t had berries last this long ever. I bought the berries I used for this crisp 2 Fridays ago so by the time I made this, I’d had them for 8 days. EIGHT DAYS. I’ve spent years telling you guys that I don’t like fruit in desserts but… the summer berries, man. They’re just so good and juicy and I want all the fruit desserts all the time right now. A crisp is my go-to fruit dessert because it takes literally minutes to put together and the top gets all crunchy and delicious. Then when you take it out of the oven, you immediately scoop out a big serving and put some vanilla ice cream on top. You have to do that. Don’t skip that part. I put “or whipped cream” in the recipe but seriously, go for the ice cream. Aaaand now the giveaway. It’s for the 3 piece set in that first photo of the Rubbermaid FreshWorks containers. You’re gonna love this set. 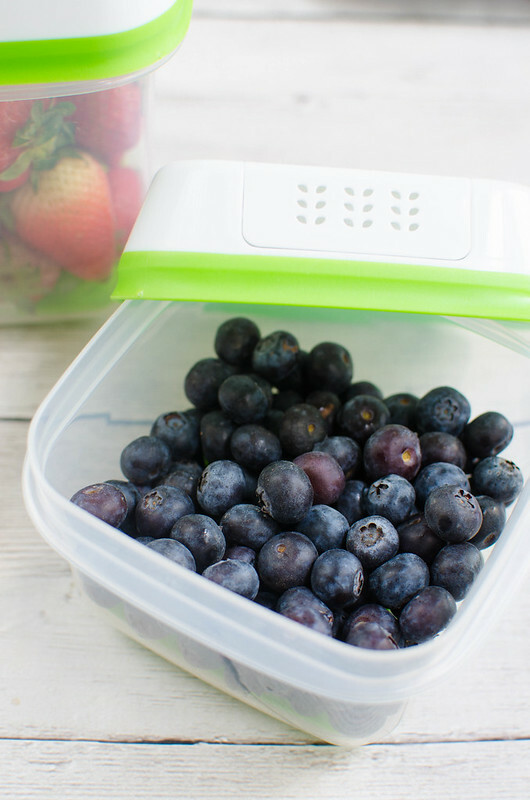 The smallest is great for your blueberries and raspberries and then the medium one is perfect for strawberries. And I’ve been keeping my spinach and arugula in the big one. They’re amazing so make sure you enter using the Rafflecopter. Preheat oven to 375F. Spray a 9x13-inch pan with oil. In a large mixing bowl, toss together peaches, blueberries, lemon juice, sugar, cinnamon, and cornstarch until all the fruit is coated. Transfer to the prepared pan. Set aside. In a separate mixing bowl, stir together oats, flour, salt, and brown sugar. Use a pastry cutter (or your fingers) to the pieces are about the size of peas. Sprinkle over the fruit. Bake 40 - 45 minutes, until the fruit is bubbly and the topping is browned. Serve warm with ice cream or whipped cream on top. 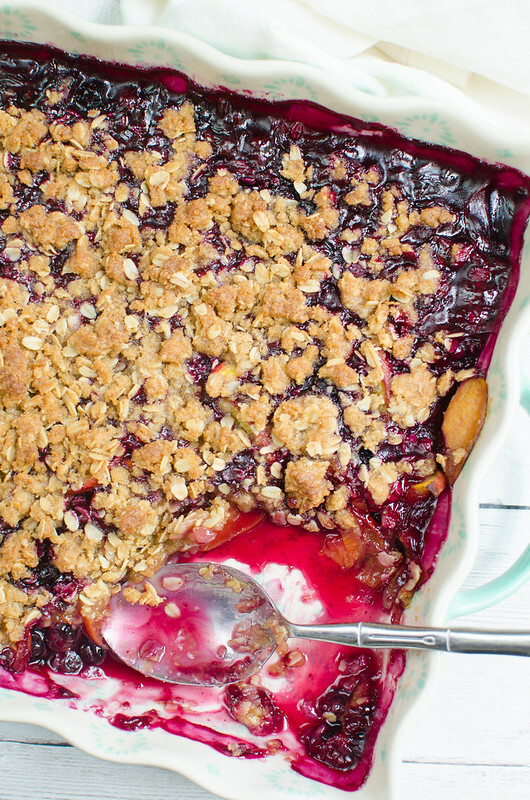 23 Responses to "Peach Blueberry Crisp"
My fav summertime recipe is quite simple. Vanilla pudding in a pie crust and topped with fresh raspberries- yum! I love anything with blueberries, pies, crisps etc! The rafflecopter didn’t come up for me. I just LOVE making strawberry shortcake!!! I keep it simple. Watermelon and cantaloupe cut up with blueberries added into mixture. Sometimes I drizzle a little honey over it. 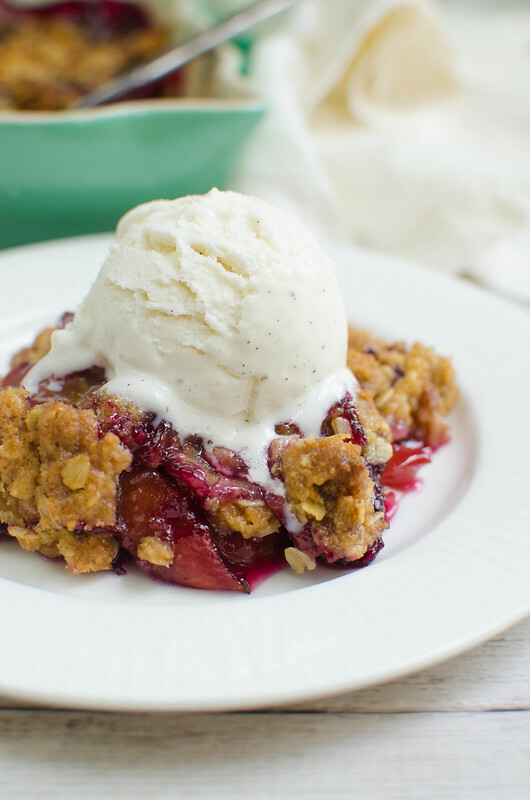 Peach or any berry cobbler with Blue Bell ice cream. 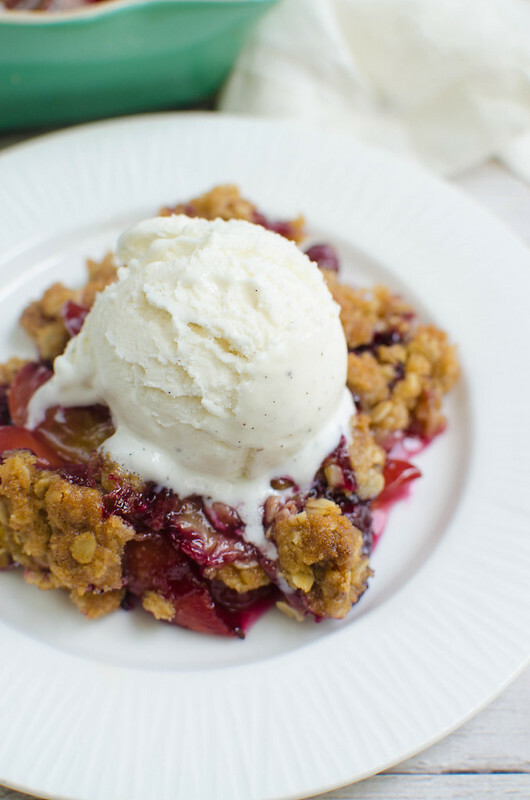 AH YES – Blue Bell ice cream with this cobbler would be wonderful ! Not sure how to fit this into Paleo, though – Hmmmmmm – guess it would be a cheat ! Easy recipe really I just love to buy all the fresh fruit and make a big fruit salad it’s so refreshing in hot weather ! I nice fruit salad with fresh fruit. I love making fruit crisps or cobbler with my fresh fruit. We love to make smoothies and salads with produce from our garden. So yummy and fresh! Peach cobbler is my favorite! We love strawberry shortcake and anything with rhubarb. So good ! So happy to find this before weekend ! Thank you so much ! Strawberry shortcake and grilled peaches with vanilla ice cream! Peach cobbler..always my favorite dessert. Strawberry pie with fresh whipped cream!